Once upon a time, nine years ago to be exact, I was but a young vegetarian traveling in a veg-unfriendly land: Eastern Europe. I spent time in Budapest and Prague, and then moved westward to Berlin. All are lovely cities in their own right and I tremendously enjoyed each one; however, the cuisines of these countries are not what I would describe as vegetable-y conscious. I recall several nights of wandering around at length, reading posted menu after menu until finding something that would suit me. It probably needs to be said that I was, at this point in my life, a much pickier eater than I am now. My college years were defined by poor, albeit vegetarian, eating habits that were structured around a long list of things I did not want to eat: mushrooms, broccoli, cauliflower, onions ….. Hmmmm , so it turns out that I was not a vegetable-y conscious vegetarian. Fair enough. While I’m at it, I might as throw in one more dark confession: I refused to even try tofu until my junior year in college, a full five years after giving up meat. Coincidentally, it was during my junior year that I took this trip to Europe. After Berlin, my European travels took me further westward to Brussels. There I discovered Belgian waffles and other vegetarian goods to eat … not what one would call healthy, but delicious, nonetheless. I also easily found restaurants where I could eat, and one of those places was a Moroccan restaurant. The restaurant was so unique and the food was so delicious that I still recall the meal with a fair dose of clarity. 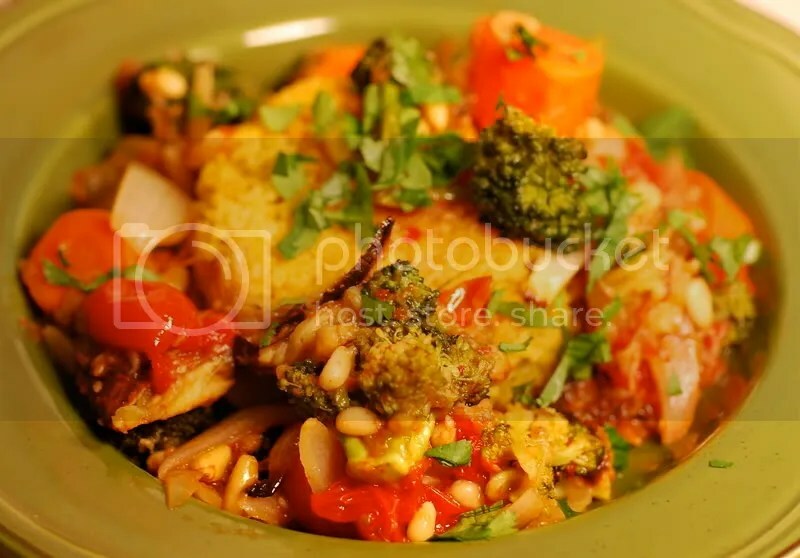 One thing that I am certain of is that the couscous and roasted vegetables that I ate that night have set the standard for roasted vegetable dishes for me. I have tried several times during the years since to recreate the taste sensation that was that dish but have failed every time, due in large part to my high expectations. Strangely enough, tonight’s dish was not borne out of the desire to recreate the dish. Instead, it was a result of the “what vegetables in the fridge need to be eaten tonight” game. As I stared at the vegetables laid out on my counter top, I quickly decided upon roasted vegetables (that’s how we’ve been enjoying our eggplant recently), and then … the gears in my brain started churning and I reached for the couscous. Tonight’s dish was saucier than the original, due to the eggplant and the tomatoes being used to create a saucy stewlike consistency with the vegetable mixture, but I was so satisfied with the results that I can finally declare success! 1. Preheat oven to 400F. Slice eggplant in half, cut small slices in cut side of eggplant, sprinkle with salt, place cut side down on an oiled baking sheet and bake for 40-45 minutes, until very soft. 2. Toss the rest of the vegetables and the sliced garlic in a small baking dish with the tablespoon of olive oil and bake in the oven for 30 minutes. 3. Bring the vegetable broth to a boil in a pot. Sauté the minced garlic in the tablespoon of oil for 30 seconds, add the spices and sauté for another minute, until fragrant. Remove from heat. 4. Add the spice/olive oil mixture, the salt, the couscous, and the raisins to the boiling broth. Lower heat to lowest setting, cover the pot tightly and simmer for five minutes. Remove from heat fro five more minutes. Remove lid and fluff the couscous with a fork. 5. Scoop the eggplant out its skin and add to the vegetables. 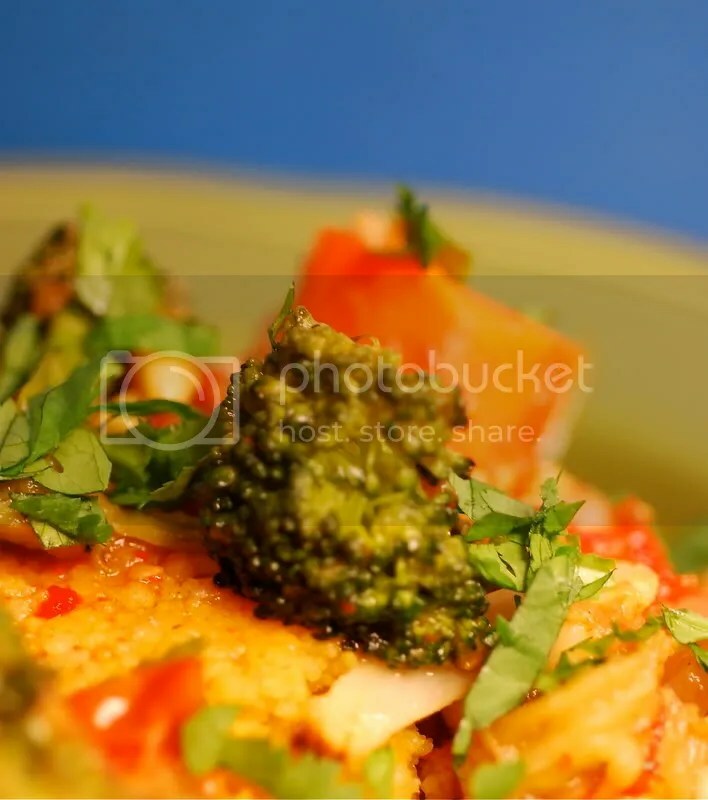 Stir up the vegetable mixture, while smashing the tomatoes with the backside of your spoon. Season with salt and pepper, stir in pine nuts. 6. To serve: place couscous in a bowl, place some vegetable mixture on top, sprinkle with fresh cilantro. Jennifer – That’s awesome! What vegetables did you use? It would be a crazy coincidence if you had the same veggies sitting around in your fridge as I did! Thursday is our green grocer day, so I just picked up what you had listed. The green grocer we use gets all of his fruits and vegetables fresh on Wednesday nights, so we make it a point to be there on Thursday morning to survey the bounty. This is the good side of European shopping, when you get to know your shop owners and their habits. Now that we know the Thursday secret, we buy a LOT more than we ever used to (probably more than we should, but everything is so fresh and enticing!) and I have hinted I want to take a photo of his displays. He doesn’t seem to mind if there aren’t many other customers to deal with, so keep a look-out on our blog to see our source someday. I love meals like that that stay with you that strongly and leave a lasting impression. I’ve really been craving Moroccan flavors lately too, so I’m doubly into this post. Incidentally, I spent some time recently in Prague and Budapest and found both cities to be very vegan friendly–certainly moreso than Boston! We ate wonderfully. Especially in Budapest–that was a real treat. Jennifer – Consider me jealous of your green grocer! Emilie – I may just have to try to make it back to that part of the world sometime in the near future. My culinary horizons have broadened considerably since my last trip so I would probably be able to take better advantage of local cuisine. Thank you SO much for this Moroccan Couscous recipe. I was searching google for a couscous and veggies recipe because I have all of those veggies on hand, but came up with nothing. You are a savior! This recipe is delicious! I have always bought pre-prepared flavoured couscous in the past but tried my hand at this & will never buy the other tasteless stuff again! I have passed this recipe onto so many people who all love it. Thanks – will def try more of these recipes!